Chronic rhinosinusitis (CRS) is a debilitating disease caused by inflammation of the paranasal sinus tissues. 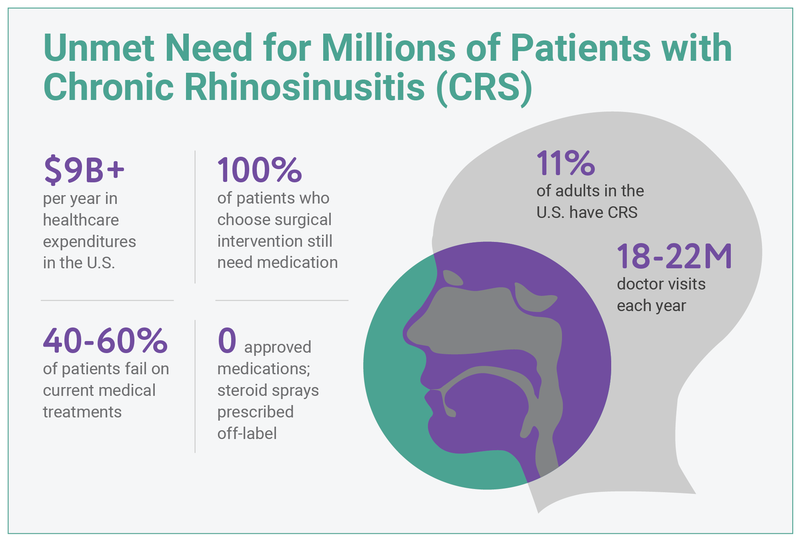 CRS is also sometimes called chronic sinusitis, but due to nasal airway inflammation that precedes and accompanies the sinus inflammation, the term chronic rhinosinusitis has evolved to more accurately describe this condition. There is no approved pharmaceutical treatment for CRS. Current treatment options consist of intranasal corticosteroid sprays approved for nasal polyposis, oral steroids and endoscopic sinus surgery. Of the patients on medical therapy, 40-60% fail treatment, and sinus surgery has not been demonstrated to confer additional benefit to that obtained by medical treatment.4 While oral steroids can be effective, their side effects inhibit routine use. Most people occasionally experience acute sinusitis, in which the sinus tissues become inflamed for a short time due to a cold or allergies. When the nose and sinuses are accosted by a pathogen or allergen, the body’s immune response causes the sinuses to swell and become irritated or infected. With treatment and symptom management, acute sinusitis usually goes away within 10 days. However, some patients experience prolonged nasal inflammation. 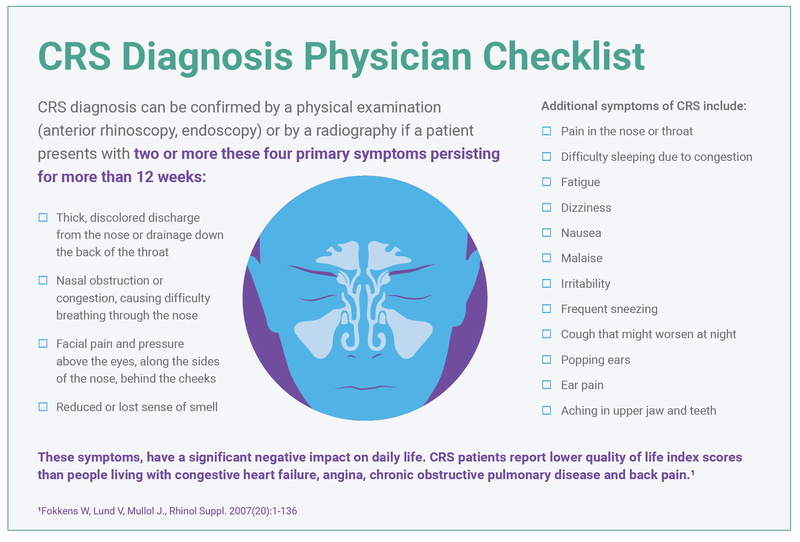 When symptoms persist for 12 weeks or longer, this illness is recognized as chronic rhinosinusitis. 1https://www.cdc.gov/nchs/fastats/sinuses.htm 2Benninger MS et al., Otolaryngol Head Neck Surg 2003;129S:S1-S32 3Smith, K.A., et al., Laryngoscope, 2015. 125(7): p. 1547-56 4Khalil H, Nunez D. Functional endoscopic sinus surgery for chronic rhinosinusitis. The Cochrane Library. July 2006.